Fantasy and reality: What do Illinois legislators know about prisons? The Vandalia Prison in southern Illinois. Seventy-five percent of the lawmakers in the Illinois House have never stepped foot in a maximum security cell block, and 40 percent of the legislators have never toured or visited a prison even once. This despite the fact that they’re the ones signing the checks for the $1.3 billion dollar per year agency. The findings are the result of a WBEZ survey of Iegislators in 2013. Ninety-five of the 118 House members responded to the survey. Map: Has your state rep ever visited a prison? We asked legislators if they’d ever been in a prison, a cell block, a maximum security cell block, and how many prisons they’d been in and when. It’s perhaps a bit of a crude measure but gives some insight into how much legislators know about the costly agency. A number of them refused to participate in the 9-question survey that takes, seriously, about 90 seconds to complete. My sense from some was that they didn’t want to go on the record saying they hadn’t been in a prison. If I’m right then the numbers above regarding how many have been in a prison and how many have walked through a cell block--they’re likely conservative. The list of legislators who refused to participate is below and includes House Speaker Mike Madigan, whose spokesman said of the survey, “It does not look like the type of activity the speaker or his staff participate in.” Numerous follow-up calls and emails went unreturned. When State Treasurer Dan Rutherford was elected to the statehouse in the early 1990s he started hosting tours of the Pontiac prison, which was in his district. “It was pretty obvious to me that one of the major expenses for the state budget is Department of Corrections, and few people knew anything about it,” Rutherford said in a recent interview. “Having grown up in a community where, you know, generations of families and friends have worked at the correctional center, I don’t think the public, really, and particularly policy makers understood what it really was,” he said. He says every two years he’d invite the newly elected freshman legislators to tour the prison, and then if there was enough room he’d invite staff members too. A spokesman for the Illinois Department of Corrections says the agency still wants as many legislators as possible to tour prisons as often as is feasible. Basically, if a legislator wants a tour, the agency will find a way to make it happen. Rep. Frank Mautino (D-Spring Valley) used to be on the public safety appropriations committee, which oversees funding for the Department of Corrections. Mautino says his committee used to sometimes meet in prisons. “If it’s an appropriation person and they’re dealing with funding corrections then they should avail themselves of the ability to go into the facilities,” Mautino said. Mautino first saw a maximum security prison when he attended a committee meeting in Menard, a maximum security prison in southern Illinois. ”It gave me a respect for the work that is done by the men and women who work in corrections and I’ve always been mindful of their needs,” said Mautino. “You can’t expect every legislator to be super interested and engaged in corrections,” said Kent Redfield, professor emeritus of political science at the University of Illinois Springfield and a former legislative analyst for House Democrats. That said, Redfield says legislators shouldn’t just be a rubber stamp. They need to know as much as possible, especially in the current climate of shrinking budgets. “If all you know is what the Department of Corrections tells you, then that really narrows the kind of decision making options and may predetermine the outcome of budget and policy kinds of decisions,” said Redfield. “No one goes in these places. That’s why they are how they are,” said John Maki, director of the John Howard Association, a nonpartisan prison watchdog group in Illinois. Maki says it’s hard to go into a prison and not start asking some serious questions about what we’re doing. “Well when you go in our prison system and you see how crowded it is, and you see how under-resourced it is, I think it would be very hard to believe that our prison system can actually change people for the better. And that’s not a judgement of the Illinois Department of Corrections. They are doing hard work with very limited resources. That’s just a kind of fact about the reality of our system,” said Maki. Maki says if legislators saw that firsthand, they would have to start asking questions about what our prisons are accomplishing and what they cost. He thinks they’d also be more thoughtful in the sentences they attach to certain crimes when they pass laws. But Maki says that’s not entirely on legislators. They’re not the only ones who don’t visit prisons to see the reality firsthand. “Typically judges don’t do this, prosecutors don’t do this, defenders don’t do this, police don’t do this. Again, outside of the people who live there, or who work there, almost no one goes in these places that are extremely expensive and where thousands and thousands of lives are kind of coursing through,” he said. But circling back to the legislators who fund the Department of Corrections and vote on the laws and sentences that put people in prison, Maki says he’s not surprised that 40 percent of legislators have never stepped foot into a prison, and 75 percent have never seen a maximum security cell block, “They don’t go to these places because their constituents don’t ask them to. If there was a demand for this, they would do it,” he said. Maki says lawmakers are representatives of the people who vote them into office, and when it comes to prisons the voters aren’t demanding anything different. 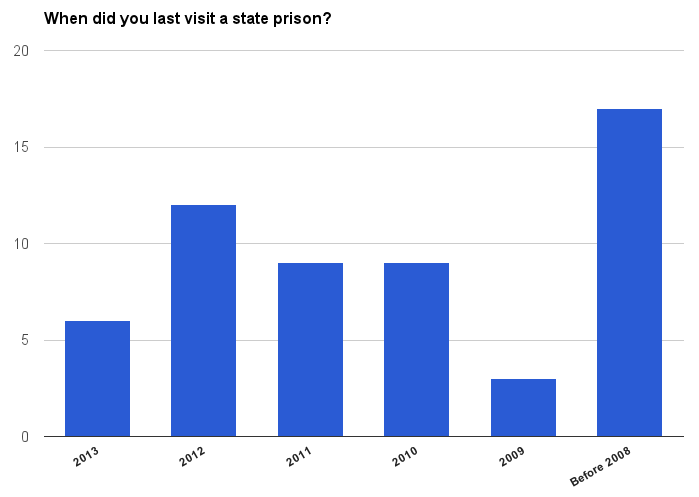 *For these visualizations, WBEZ surveyed all 118 of the Illinois state representatives about their familiarity with the state&apos;s prisons. The survey involved in-person interviews and a nine-question online survey. Of the 118 lawmakers, 95 answered the questions, and 23 refused to provide any information. 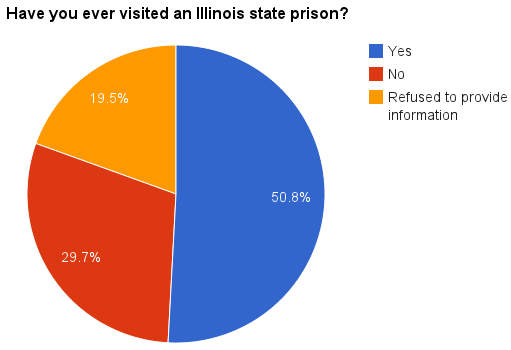 Map of responses to the WBEZ state prison survey by Illinois House district. Click on district areas to see complete responses from individual state representatives. *Survey results do not include three Illinois state representatives who took office after August 2013. Results do include three lawmakers who stepped down after August 2013. 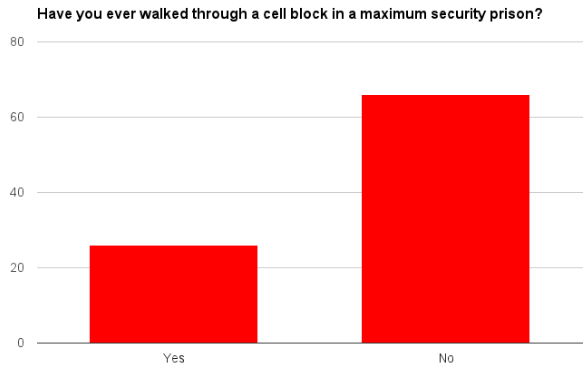 Complete responses to the WBEZ state prison survey. Sort the chart by name, party or district to find your lawmaker&apos;s responses.